She believed if she raised a slogan from the world’s highest peak she would be heard. Her message: ‘Fight Against Human Trafficking’. 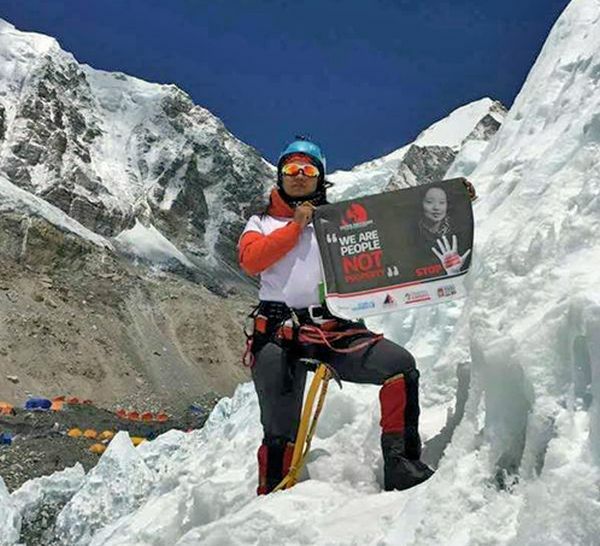 Kanchhi Maya Tamang, a trafficking survivor, summited Mt Everest with the message on Sunday, becoming the first to climb the world’s highest peak for women empowerment and gender equality, according to UN Women Nepal. She is also the first Tamang woman from Nepal to scale the 8,848-metre peak. Tamang also carried a banner through her arduous trek that read, “We are people, not property”. Not alone in her belief, the returnee migrant worker from Sindhupalchowk -- a three-hour drive from capital Kathmandu -- was accompanied by 19 other climbers who found a fair weather to make final summit pushes. Tamang reached the peak at 6:00 am, officials said. In association with UN Women, Tamang and Pemba Dorje Sherpa climbed Mt Everest to spread the message from the roof of the world. “Dorje has scaled Mt Everest 16 times,” said Gyanendra Shrestha, a liaison officer at the ministry of culture, tourism and civil aviation. Besides Kanchhi Maya and Pemba Dorje, the 19 other climbers included nine Nepalese and the rest were foreigners. Everest has seen a record number of climbers this season due to a backlog resulting from the 2014 and 2015 avalanches. More than 375 climbers from around the world have been waiting for weather to improve to make summit attempts. As many as 25 climbers, including six Indians, stood atop the world’s highest peak from the Tibetan side after nine rope-fixing Sherpas opened a climbing route to the summit point earlier this month. Officials say nearly 150 climbers will make their final summit pushes from north side within the next couple of days. A date with eternal beauty: Everest!